To view Lectionary 165, click here. In history, by his actions, the only almighty God has revealed himself to Israel and has done good to her. Continuing to receive this good requires that she keep his revealed Law. God reveals his inner life by his works (CCC 236). Through the events of the history of Israel, God reveals that he is one, almighty, and good. Blessed the people the Lord has chosen to be his own. Who are the people the Lord has chosen to be his own? God chose the whole human race in Adam and Noah. He chose the Jews in Abraham, Moses, and David. In Christ, God chooses Christians. In Christ, God chooses everyone but some don’t know it and some don’t want it. Those who don’t know it need our apostolate. Those who don’t want it need our good example. As Moses recounted, the Lord did good to Israel. What is the good God does for us? He leads us by the Spirit of God, by the Holy Spirit. He blesses us with life and saves and sanctifies us. Who is God who does good to us? He is God the Spirit, who makes us God’s sons by adoption. He is God the Son, Christ, with whom we are joint heirs. We glorify God—who he is and what he does—by being his glorious handiwork. How then can we be glorious? We can do so through contemplation of truth, enjoyment of beauty, and especially doing good, even in suffering. In the Eucharist, we glorify God by our gifts, prayer, and praise. In the Eucharist, God glorifies us by giving us his Son and the Holy Spirit. As we saw in the first reading, Moses declares the one God and orders Israel to keep the commandments Moses enjoins on them. Now, Christ declares three persons in the one God and orders his disciples to make disciples of all nations through baptism in those three names—the Father, the Son, and the Holy Spirit—and orders those disciples to keep the commandments Christ enjoins upon them. Just as Moses’ revelation was for the good of the Jews and their children in their earthly life, Christ’s revelation is for our good and the good of our children so that we may have eternal life. 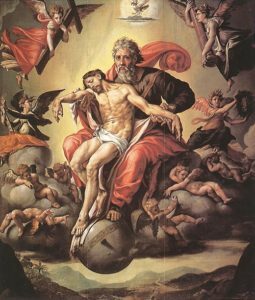 At the core of our Catholic faith is the mystery of the Trinity, and the invitation for us to participate in this divine life (Homiletic Directory §21). This reality about God is revealed and man’s salvation is effected through the Paschal Mystery (HD §21), which is re-presented in this Mass. What is revealed about God? There is only one God. Yet within this one God there are three persons, the Father, the Son, and the Holy Spirit. Jesus reveals that God “is Father not only in being Creator; he is eternally Father in relation to his only Son, who is eternally Son only in relation to his Father: ‘No one knows the Son except the Father, and no one knows the Father except the Son and any one to whom the Son chooses to reveal him’ (Mt 11:27)” (CCC 240). This is why “the apostles confess Jesus to be the Word: ‘In the beginning was the Word, and the Word was with God, and the Word was God’; as ‘the image of the invisible God’; as the ‘radiance of the glory of God and the very stamp of his nature’ (Jn 1:1; Col 1:15; Heb 1:3)” (CCC 241). This is why, “following this apostolic tradition,” the Church calls the Son “consubstantial with the Father, that is, one only God with him” (CCC 242). One very accessible image we have of the Blessed Trinity is the human family. This week we can make the Sign of the Cross and pray the Doxology with more awareness and gratitude for what the Blessed Trinity has done for us and with longing to see these divine persons face to face. We can also mediate on how our families—whether families of birth or of marriage—have been, are, or could better an image of the Blessed Trinity.